If you've been reading my blog for a while you might remember a few summers ago (yep, two years ago almost!) I took Kendi's 30 for 30 challenge. It was a lot of fun, very challenging, but very interesting and I've been wanting to give it a go again ever since, but I've never found an opportunity. However a couple of weeks ago I was getting pretty mad at myself for my relentless shopping (#bloggerproblems) and not enough wearing, so I decided to take the challenge again, only this time with workwear. The honest truth is most mornings before work I throw on a dress and don't think any more of it. 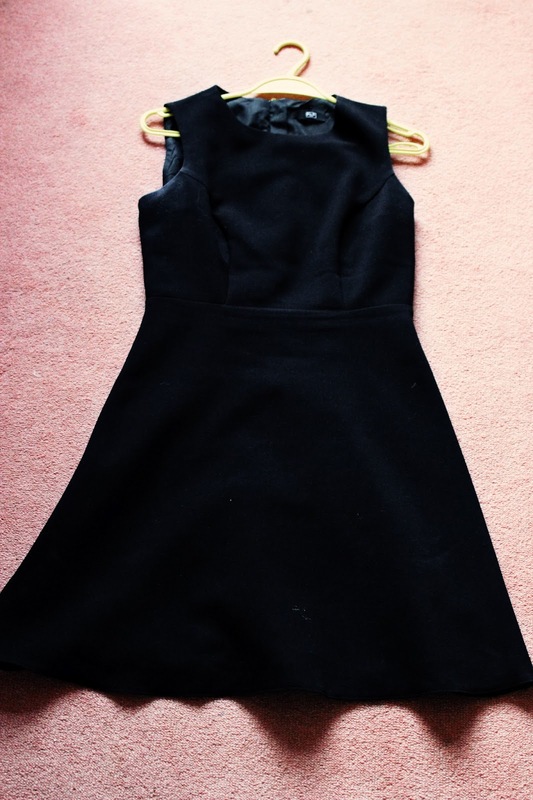 I have lots of lovely pencil skirts and blouses but more often than not a dress is the easiest option. In fact, I wore a dress four days out of five last week. But I like creating interesting outfits. I like creating outfits that I can't wait to blog, and I don't want to just save that for the weekend (especially as I'm usually so busy at the weekend that I don't have time to photograph what I'm wearing anyway!). So I decided a new challenge would be a great way to awaken my creativity. An every day 30 for 30 wasn't going to work this time; I have a dress code for work and I dress completely differently at the weekends, so I didn't want to do something all-encompassing, plus I only wear non-workwear two days a week so a 30 day challenge for weekend wear would take weeks! Plus, I've had a couple of people ask me for advice lately about dressing for work. A workwear challenge is a great way to demonstrate that you don't need a hundred different pieces to have a great working wardrobe, and it helps me get out of my throwing-on-a-dress rut. So, I introduce you to my 15 for 15 workwear challenge. This challenge will take place for 3 working weeks (plus one day with the bank holiday) Monday to Friday, and will involve 15 different outfits made up from only 15 pieces. 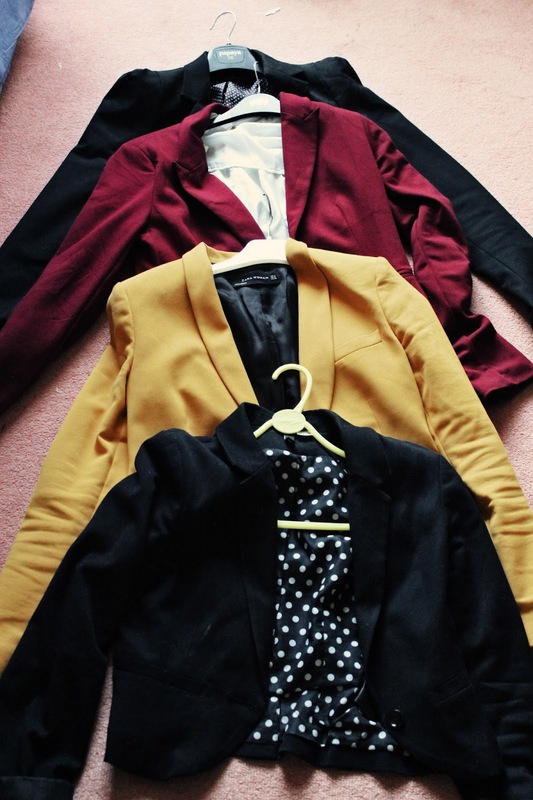 These pieces are 5 blouses, 4 skirts, 1 pair of trousers, 4 blazers and one dress (that makes 15, right?!). Shoes and accessories do not count (I pretty much only wear one pair of work shoes anyway!) but every outfit has to involve different combinations of the items. I will take photos each day, but probably won't post every day (it's likely that I'll post a couple of outfits per post). Also, an advanced warning; my hair and makeup will probably look like crap most days. Taking photos is likely to happen right before I dash out of the door! I chose these pieces on a vague colour scheme of mustard, maroon, black and white, and ensured I had enough black and white pieces for meetings (I have about 4 of 5 in the duration of this challenge), but lots of fun pieces for office days. 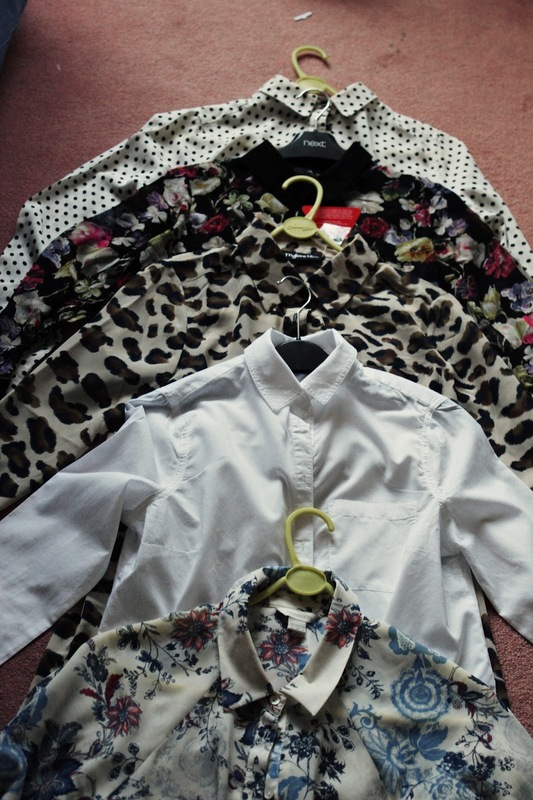 Generally I've gone with plain coloured skirts and a variety of different printed and patterned shirts. I have lots of ideas for these items and I'm really happy with my choices. I've also decided, in reflection of Kendi's original rules, to go on a shopping ban for duration of the challenge. 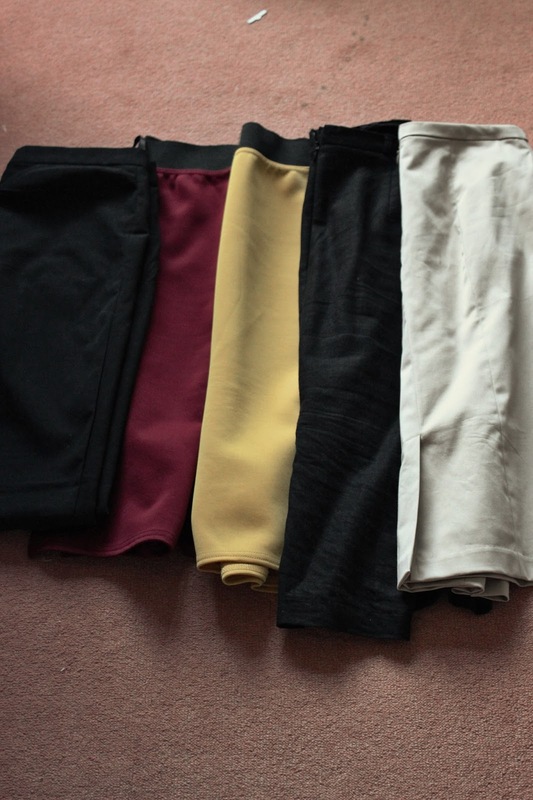 There is a good chance I will fail at this (I have failed at shopping bans before), but I know I have 3 weeks worth of workwear here (if not more) and I have tonnes of weekend clothes, so hopefully I can try to make it through. Oh and final disclaimer- because of the pieces I have chosen there is likely to be some overlap onto outfits I have worn on my blog before. These will not have their own posts, but may be incorporated into posts with other outfits. I took my first outfit photos this morning so the challenge is officially on! I'm already realising what a challenge it will be, but I'm excited to try something new! Let me know if you want to join me! I'll be back with the first week of outfits later in the week! Yay, I'm so excited for this!! When I was working at the school, I stuck to 'workwear' a lot, but I don't really any more because my office doesn't really have a dress code. But I'm really excited to see how you mix these up :D I might have to do the same sometime soon..or maybe just do photos everyday because I don't feel like I could do another 30 for 30 type challenge! Ooh, interesting take on it. You have so many nice blouses that I'm rather jealous. All these clothes seem to go really well together all ready, so it seems like you'll have no problem mixing them, though do you get a bit bored by the end of the challenge? This looks great, I really like personalised workwear, it is definitely something I would recommend to others. for this blog! Loving info! !